We’re sharing a bit of the winter bugs going around so it’s only my 4 year old at school today. Hope everyone is staying healthy! She’s having soba noodle pasta with Italian seasoned tofu stars and red pepper stars mixed in for color. In the top left compartment of the Easy Lunchboxes container is a seckel pear and mini carrots in the top right. Snack in her Happy Tiffin stainless bento box includes organic raspberries, a crimson gold organic apple and cashews and pistachios in the round container. This afternoon we had some friends over to play. 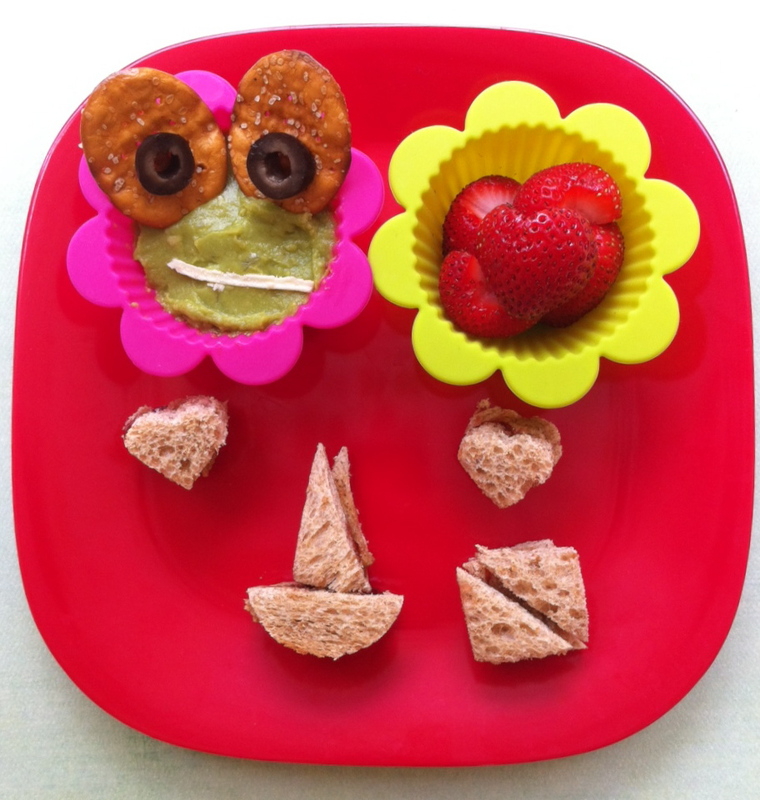 I made some quick snacks with our FunBites Luv It cutters. 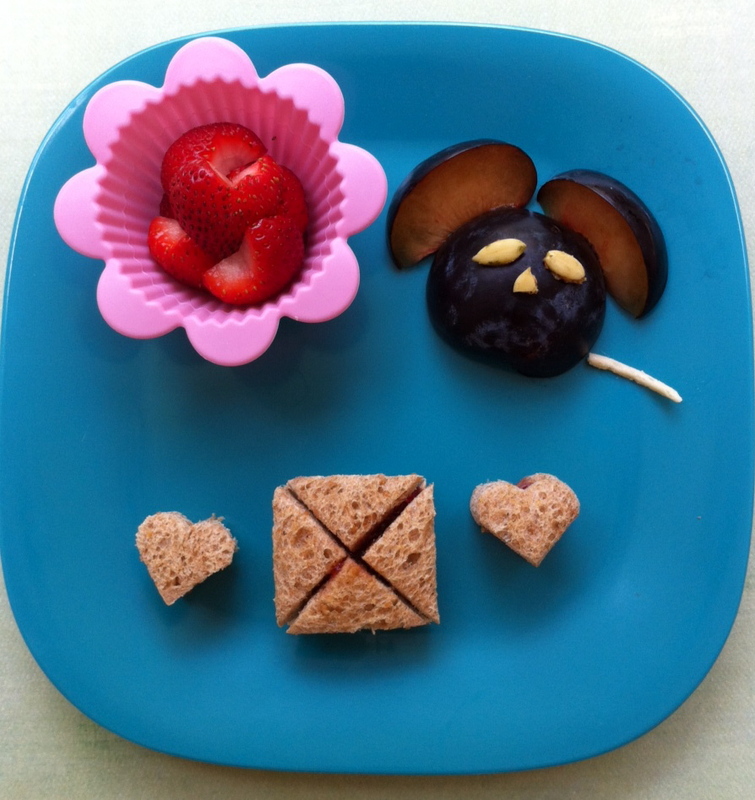 The girls had almond butter and jam mini sandwiches, strawberry hearts and this snack had a plum mouse with pumpkin seed eyes and nose and a Daiya (dairy free) cheese shred for the tail. The second snack is a guacamole face with pretzel dippers and sliced olive eyes. The mouth is a piece of Daiya (dairy free) cheese shred. I made the rest of the FunBites mini sandwiches of almond butter and jam and strawberry hearts. My husband had a baby spinach salad with teriyaki marinaded tofu in the middle and in slices around the edges. I used a mini cookie cutter for the house shape. I also included some yellow heirloom tomatoes. 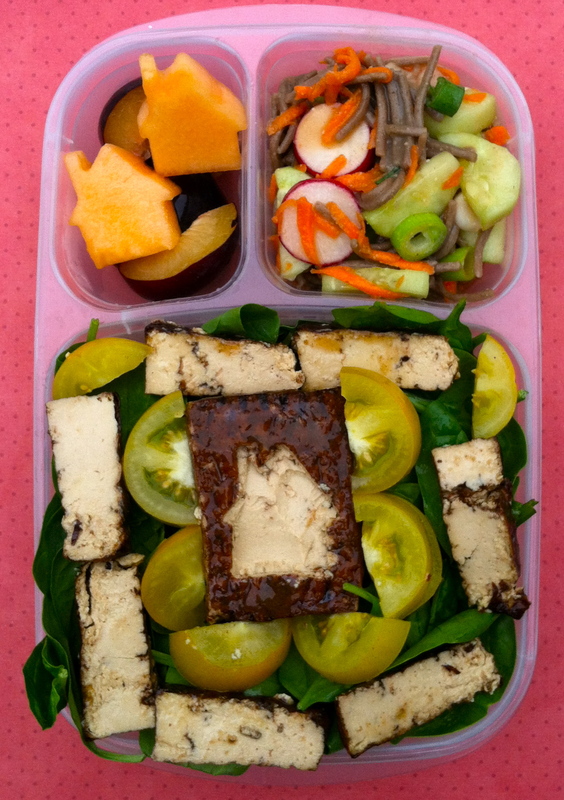 At the top left are plum wedges and cantaloupe houses, and at the top right is a leftover soba noodle salad with cucumbers, scallions, radishes and carrots all packed in his Easy Lunchbox. Not shown was his favorite ginger dressing.